One Sunday March 15, 2009, Rev. 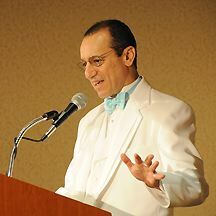 Tony Ponticello addressed the congregation at the Community Miracles Center in San Francisco, CA. What follows is a lightly edited transcription of that lecture. Two weeks ago we were at our conference, “A Blessing From The Abundance of Grandeur.” Many of you were there as well. I spoke about many things (*1) and that’s a picture of me at the conference on the cover of the program, looking rather sharp in my white tuxedo. I spoke about our economic situation, among many other things. I spoke about our conference gathering being a spiritual stimulus package. People really resonated with that idea so I thought I’d expound on it a little bit more. At the conference I was talking about the conference itself being the spiritual stimulus package. I’d like to open that up a bit and talk about how we metaphysical students, we A Course In Miracles students, are a spiritual stimulus package for the world and one that the world absolutely needs. Right now the world is contemplating the effectiveness of our governments economic stimulus package, and there’s a lot of debate whether it is effective or not. There’s a debate with both political parties. Maybe it’s not enough. Maybe it’s focused in the wrong direction. It’s an interesting little discussion. There’s not only a national discussion there is also a world discussion. In fact, the past week the G 20 nations met to discuss a world economic stimulus package, some way that all of these countries, the most dynamic financial countries, could do something in joint effort so that we could really kick start the world economy. President Obama has called on all of us to have patience, hope, and courage to do what we can do, individually, to not despair, to hang in there, to have faith that this economy is going to turn around. This week we had a little bit of good economic news. The stock market went up 600 points. People are wondering whether this is the beginning of the economic recovery. Has the market actually reached its bottom and is it now bouncing back. I think we, as A Course In Miracles students, as metaphysical students, ask ourselves a personal question, “What can we do?” Can we actually make a difference in any of this. Is it called upon us to make a difference, or is this beyond us, or not even something that we should be focusing on? That is also a big discussion. Perhaps it’s to worldly for us to be even thinking about. Shouldn’t our work be more internal and just be about peace of mind? A Course In Miracles says, “Mental health is inner peace. It enables you to remain unshaken by lack of love from without and capable through your own miracles of correcting the external conditions which proceed from lack of love in others.” (Tx.Or.Ed.2.17) So, ACIM does talk about us correcting external conditions. It speaks of it very frequently actually, especially if you are reading the Original Edition and not the second edited version of the book. It talks about how we actually do engage with the world and how we can make a difference in the world. We are capable of correcting external conditions. We still do it through an internal mental correction, but we expect the external to reflect some of the mental corrections that we make. The phrase, “Can we make a difference?” only needs to have the word order changed to become. “We can make a difference!” It’s just a different perception of the order of the words. I do believe that we can change the world, and the following passage will say this again. “The world would be completely changed should any two agree these words [I want the peace of God] express the only thing they want.” (Wk.Or.Ed.185.2) We’re certainly more than two people here today and I think that we can all agree that we want the peace of God. We can take that one step further and see how our agreeing about that literally does change the world. It does change it, I believe, externally. I think that we are a very strong stimulus package for the changing of the world and for the world getting through this tough time – this perception of a tough time – this economic downturn that we have taken. A Course In Miracles says this in the Manual For Teachers, and I think that it is an important passage for us to keep in awareness, especially during this difficult time that the world is going through. “First, they [the teachers of God] must go through what might be called ‘a period of undoing.’ This need not be painful, but it usually is so experienced. It seems as if things are being taken away, and it is rarely understood initially that their lack of value is merely being recognized.” (Mn.Or.Ed.4.5) I believe, and I have spoken of this before, that what the world is going through is this period of undoing. It’s going through a change in its value system, and it’s probably going to be perceived as painful for all of us who are going through it. It doesn’t have to be perceived as painful, but if the Course says that it is usually so experienced, then I will take the Course at it’s word. It is probably going to be experienced as painful, but we could shift off that pain if we could recognize that we are not actually losing anything. We are just having a shift in our value system. So I think this is a very important quotation. In another place, A Course In Miracles tells us, “Loss is not loss when properly perceived.” (Wk.Or.Ed.284.1) Even though there seems to be loss in the world, if we were to perceive it properly, we wouldn’t actually be perceiving it as loss. In another discipline that I study, a mental health discipline named Recovery, it says, “If you can’t change the situation, you can choose to change the way you think about it.” We can’t, right away, change the situation, this economic downturn, that we are going through in the world, but we can choose to change the way that we perceive it, the way that we think about it. How does this work at a very basic hamburger and onions level? (I put onions on my hamburgers.) How does it work? I don’t have as much money to play with as I had a year ago. That’s the truth. My personal income has gone down. My net worth has gone down. The money that I do have, and I do still have money, I am more reluctant to spend because I have less. I am not doing the things I used to do. I frequently went out to the movies. I frequently went out to dinner with friends and, while I still do these things, some, I don’t do them as often as I used to. Yesterday, I did go out to the movies. Yesterday evening when I went out to the movies I noticed something. This has been a gradually dawning realization of mine. When I watch a movie in a movie theater I miss half of the dialogue. The actors are talking. I hear them, but frequently I can’t quite make out the words. I don’t know if it’s my hearing that is getting bad, or maybe the actors are just mumbling, but I don’t hear a lot of the dialogue even in American films. If I go to a film that comes from the United Kingdom and they are speaking with their heavy British accents I really miss a lot of the dialogue. However, when I stay at home and watch a movie on a DVD I turn on the subtitles and then I don’t miss any of the dialogue. I’ve been doing that more lately because it’s economical to stay at home and watch a movie on DVD, and what I have now realized is that I actually enjoy watching movies at home more than I do going out to a theater and watching them, because I can easily read all the dialogue. I get into the movie much faster. I don’t miss important ideas that the movie is trying to express. I, also, know that movie dialogue is written by the most talented writers that we have working on the planet today. It’s really good, this dialogue. I want to understand it. I realized that I actually like the experience of watching movies at home more than I like the experience of going out to the movies. Now, add to this that when I go out to the movies I eat out, and spend a lot of money. I, possibly, do not eat the best food. When I stay at home I save money. I eat what I truly want and usually more healthy than I do when I go out. What am I really giving up by not going out to the movies as much as I used to because I don’t seem to have the money? I’m giving up not having as good of an experience of a movie. I am also giving up eating too much bad food and paying too much money. What do I gain? I have a better experience of a movie. I eat better food so I am healthier. I spend less money. When I watch a movie at home or at a friend’s house I have a more intimate time with the people I am watching the movie with, so my relationships are better. I have a relationship gain. I have an experience of a movie that is better. I have a food gain, relationship gain, money gain. What am I really giving up? I could focus on the fact that I don’t seem to have the money that I used to, so I don’t go out as much anymore, or I could focus on the fact that I am actually having a better, more valuable, experience. It’s all just a matter of what I choose to focus in on. It doesn’t get any more hamburger and onions than that. Think about this in your own life. Are you really giving up anything or are you possibly gaining something that is of greater value? I talked about the G 20 nations getting together. If you don’t know what the G 20 nations are I’m going to tell you. I always like to do a little research for my sermons. The G 20 nations stands for “Group of 20”, and actually, it isn’t 20 nations. It is only 19 nations and the European Union. The European Union is that group of European nations that have joined together to have a common economic system. These are the people that brought us the Euro, which is the new currency now being used in Europe. These 19 nations plus the European Union are the nations that have the largest gross domestic product in the world. They get together every once in awhile to talk about the world’s financial situation. These 19 plus European Union nations represent 90% of the gross national product of the world. They also represent 80% of the world’s trade and 67% of the world’s population. It’s a large group and certainly the strongest economic group, or block, of nations. What’s just amazing to me is that these nations even decide to get together and talk about anything without hating each other. These aren’t nations that usually get along. These aren’t nations that would normally talk to each other. Just to name a few we have: Russia, China getting together with South Korea, South Africa, Indonesia, Japan, the United Kingdom, France, the United States ... these are nations that can frequently be very contentious politically. However, they get together in these economic summits. They all get along. I think it’s a miracle. They all got together this past week to talk about the global economic situation. The only other thing I know that brings nations together like this is the Olympics. It’s interesting. International sports competitions will bring people together and international economic conditions will bring people together much more often, and much more successfully, than international politics will ever bring people together. Do we choose to see that we have a financial problem? Possibly we have a wonderful opportunity for countries to get together by joining in common purpose. That’s a positive way to see it. I might not be able to immediately change the economic situation but I can choose to change the way I think about it. We also are getting to see how interdependent all our countries are. This economic situation, because it has spread over the whole world, has shown us that the world is truly interdependent. This idea of separate nations with their own little separate economies has started to dissolve. National boundaries have started to blur. There is an illusion of separate countries but it truly is that. It’s just an illusion. There actually is just one economy and one people here on this globe. Is the current economic situation a bad thing? Is it a good thing? It depends entirely on how we choose to perceive it. A Course In Miracles students are frequently in a little quandary about this word “perception.” When ACIM talks about us shifting our perception does that mean we just shift how we interpret things, or does that mean that how we physically see things is actually going to change. There’s a lot of debate about this. There are a lot of people in the school of thought that we only shift how we interpret things and nothing external changes. However, there is a very important passage in the Course that says this, “There has been much confusion about what perception means because the same word is used both for awareness [how we see it] and for the interpretation of awareness. Yet, you cannot be aware without interpretation, and what you perceive is your interpretation.” (Tx.Or.Ed.10.60) So, I think ACIM is very clear that “perception” means both. Whenever it says, “perception” it means both. It means the way we interpret things, but it also means the way they actually appear to us externally as well. Actually those two things are the same. The world is a mirror that is showing us our interpretation. That’s why I am of the belief that as we change our thoughts from loss to abundance we should be able to see abundance in the world because our inner perception, our inner interpretation, has changed and now we expect to see an external manifestation of our inner shift. I just found three quotations from A Course In Miracles very easily that reinforced the idea that what we actually see out there is a result of what we are thinking. “Yes” when we shift our minds, shift our internal perception of things – our internal interpretation – of things we can absolutely expect to see a shift in the external world. I fill out an Abundance Journal (*2) every day. This is very similar to a gratitude journal but I write down things that seem to be abundant to me. Now the world, and myself, is going through this perception of lack, but in truth, every day, I have no lack of things to write down in my Abundance Journal. I can fill a page in my Abundance Journal with abundant things that happen to me, or abundant perceptions that I have, just as easily now as I could two years ago when my net worth was almost twice what it is right now. On paper, there could be this perception of loss but my experience is just as abundant, or possibly as non-abundant, as I choose to acknowledge. If I choose to look for abundance, I definitely can find it. A Course In Miracles is clear about this, “For what you look for you are far more likely to discover than what you would prefer to overlook.” (Tx.Or.Ed.21.49) We need to be aware of this. We need to look at our thoughts. We need to actively choose different perceptions when we find ourselves in perceptions of lack. We’ve had an outrageous requests from our President, to have faith and to do our part. Possibly this is our part! This is our part as spiritual people. This is our part as metaphysical people, to be part of the spiritual stimulus package that will go forth and be a healing influence on the world that we seem to find ourselves in. A Course In Miracles says, “There is a way of finding certainty right here and now. Refuse to be a part of fearful dreams whatever form they take, for you will lose identity in them.” (Tx.Or.Ed.28.38) ACIM just told us don’t be part of fearful dreams. Refuse to be a part of them. Refuse to be part of this fear that seems to be so prevalent in the world right now about the so called terrible economic situation that we find ourselves in. We have an On-Line Discussion Group (*3) that is associated with the Community Miracles Center’s web site and our members post all kinds of things on that. Someone was posting some quotations from an author named Carlos Castenada. I loved Carlos Castenada many years ago. His literature was very important to me. I started reading Carlos Castenada in 1974. It was actually the start of my spiritual journey. I have a very fond memory of him because of how he came into my life. I had just graduated from Cornell University, which is a very rigorous academic institution, and for four years I had done no reading except the academic reading that I was supposed to have done for whatever classes I was in. I was given tons of stuff that I was supposed to read, much of it was very dry, boring and really hard to read. I had only read text books, mostly scientific text books, for four years. After four years of reading dry, boring text books I had trained myself to hate reading. I couldn’t read after my college graduation. It was a very distasteful process for me to read after four years of college. I realized this one day, a month or two after I graduated. I picked up a book and I couldn’t read it. Reading itself had become a negative experience for me. So, I went into this bookstore and I told the clerk in the bookstore, “I’ve just gotten out of college and reading ... I can’t find anything to read that is interesting and engaging that I will enjoy. Can you recommend something that will really be engaging and interesting.” He took me right over to the Castenada books and said, “Read these books. They are really interesting.” He was right. Reading the Carlos Castenada books got me reading again and it got me reading metaphysical literature, spiritual literature. It started my whole spiritual journey. I know, as of late, that Carlos Castenada has fallen from grace and many people think that his accounts were all a hoax. It doesn’t matter to me whether they were a hoax or not, these were important and powerful books for me. One of the things Carlos Castenada said in his book, Tales Of Power, was this, “The basic difference between an ordinary man and a warrior is that a warrior takes everything as a challenge, while an ordinary man takes everything as a blessing or a curse.” That’s how we tend to look at things when we are in ordinary perception. We think that something is a great thing. We think something is an awful thing. Everything is either a blessing or a curse. A warrior sees the blessings as a challenge and sees the curses as a challenge too. They are both challenges. Every thing is a challenge. Everything is here to propel us to a new level. How are our blessings a challenge? Spiritually we can think of them as problems because we tend to get hooked into them. The positive things we get attached to, fixated on, and we want more of those things. They become important desires that are bad, and so that’s one challenge. We have to challenge ourselves not to do that. We have to challenge ourselves not to get hooked on the good things, the blessings. However, I also find that I have to challenge myself not to take the good for granted either. That’s also a challenge. I take good things for granted. There’s many good and wonderful things in my life all the time, but I just tend to take them for granted. When I am truly working on that issue, not doing that, then I see every good thing as something truly positive that I want to acknowledge and bless. I see the food that I eat as good. How often do we bless the food that we eat? I do it sometimes; I don’t do it other times. Food gets put in front of me, then without even thinking about it, I just start eating it, completely taking it for granted. My mind can be totally elsewhere and frequently thinking something negative. Think about how we’re poisoning our food by having negative energy while we’re eating it. We’re wondering why we’re not as healthy as we should be. If we could stay positive while we are eating, if we would bless that food, it would become truly healing and energetic for us. I like to bless my home. Every morning when I wake up I like to bless that I’m awake in a home, in a comfortable place. I write that every morning in my abundance journal. “I awoke at home.” That’s an abundant thing. I got up. That’s an abundant thing. I make a cup of coffee. That’s an abundant thing. If I can get up and make a cup of coffee, those things in and of themselves, at the start of my day, are great things. My life is already abundant just by getting up and making a cup of coffee if I choose to think of it that way. If I have a place to go work and I have important work to do, that’s abundant. If I have anything to do and I do it, that’s abundant. The other day I cleaned my bathroom and dusted the living room furniture. I put those things down in my Abundance Journal. A friend calls up and says “Hi.” That’s abundant. I choose to spend some time with a friend. I spend an evening with a friend. That’s abundant. I take a walk; I go to the gym. That’s abundant. I make some money. That’s abundant. However, even on those days when I don’t make any money, if I just choose different values about my life that day can be abundant too. There’s always abundance there. There’s always abundant growth that we are going through if we choose to perceive it that way, and that’s what I believe our spiritual mission is. That’s how we can help the spiritual and economic recovery of our society. I think that’s what we are here to do, and that’s what our President is calling us to do as spiritual people. That’s how we, substantially, could contribute to the economic recovery of our nation, and of the world, by being the spiritual stimulus package. Carlos Castenada also said this in the book, Journey To Ixtlan, “The trick is in what one emphasizes. We either make ourselves miserable, or we make ourselves strong. The amount of work is the same.” It’s always the same. We’re always going to focus in on something. What do we choose to focus in on. A Course In Miracles says something very similar. It tells us, “Would you not rather greet the summer sun than fix your gaze upon a disappearing snowflake and shiver in remembrance of the winter’s cold?” (Tx.Or.Ed.19.48) What do we choose to do? This quotation has very poetic imagery. Do we choose to see the sun, to feel warm, and blessed or do we choose to remember something cold and shiver? That’s always the choice that is there. I had a nice suit to put on this morning. That was abundant. I had clean underwear to put on this morning. That was abundant. I wrote both of those things down in my abundance journal. Economic loss, do we focus in on that or do we choose to focus in on our spiritual stimulus package. I think we clearly have work to do. We have important work to do that helps not only us, it helps our friends and family. It helps the whole world as well. I know we have our work clearly cut out for us so I say, let’s get about doing it. That’s my talk for today. Thank you. *1) Rev. Tony’s lecture “What Is Blessing? What Is Abundance? What Is Grandeur?” given at the 2009 ACIM conference can be heard by purchasing *Rev. Tony’s Lectures on A Course In Miracles 9A* available through the CMC Bookstore for $9.95. *2) The full title of *Abundance Journal* is *40 Miracle Of Abundance Plan* and can also be purchased through the CMC Bookstore for $4.50. © 2009 Rev. Tony Ponticello, San Francisco, CA – All rights reserved. This article appeared in the March 2009 (Vol. 23 No. 1) issue of Miracles Monthly. Miracles Monthly is published by Community Miracles Center in San Francisco, CA. CMC is supported solely by people just like you who: become CMC Supporting Members, Give Donations and Purchase Books and Products through us.